Turning viewers into a virtual version Hurricane Florence, led by a host surrounded by virtual danger, used the network's approach to show residents along the hurricane route why they should evacuate their homes. The most recent major forest fires in the state are currently flaring through the Sequoia National Forest. According to experts, the most dangerous time for forest fire outbreaks is in October. 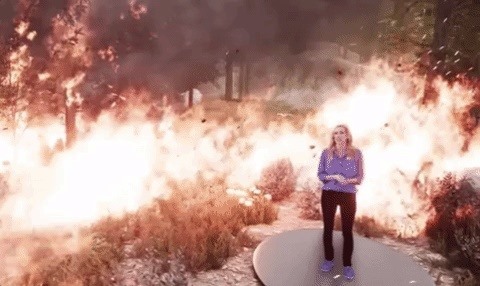 To show how forest fires begin, Weather Channel's meteorologist, Stephanie Abrams, appeared on Thursday at the same circular platform that we had seen during the presentation of Hurricane Florence. Only this time, the hostess will be shown surrounded by forest and wildlife while she sets up 3D displays in front of and behind her. But this presentation takes on something when Abrams explains in one part how glow can go up in flames. The camera seems out of focus and zooms in on a floating ember leaving the host blurring in the background before moving the focus back to its platform. The simulation is a great example of the kind of seamless varifocal experience that researchers use to develop AR Smartglasses and VR headsets to enhance realism. In another moment, Abrams is surrounded by flames and you can see virtual smoke passing by her face. Although it's not something you experience with an AR headset or even an AR app on a smartphone, which makes Weather Channel's technology accustom the viewer to consume content in the context of immersive environments. Whether the person is immersed in the virtual presentation is the host, the viewer, or both. That makes us the future of news production, and it seems to get better every month.